I had completely forgotten about this one which I am sure was only with Plymouth for a short time I guess to compare it with the 4 Mercedes 709s purchased at the same time. Thankfully the company went for the Mercedes buses rather than more Renaults. Even after all these years, my mind just cannot believe my eyes when seeing a Reeve Burgess/Plaxton Beaver with anything other then a Merc T2 grafted to the front. It feels like I've slipped into an alternate dimension.. 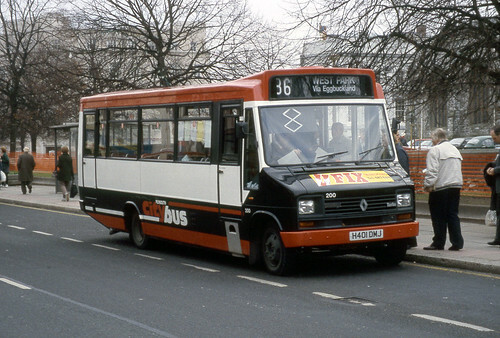 This bus spent about a year with citybus hence it getting full livery and fleetnumber it is largely forgotten that it was ever there but it was as the excellent pictures shows it went on to Tyne and Wear to work with Welcome bus and in 2000 was still wearing citybus livery minus the names.